Very few high-schoolers want to miss out on their prom. It’s something that students look forward to since they’re young, and when their time rolls around, they’re ready to go all-out. That being said, it’s hard to deny that prom is a pretty expensive night for 16, 17, and 18-year-olds. From the cost of the tickets, to the flowers, to the prom dresses and tux rentals, it adds up pretty quickly. However, if you make a plan and prepare accordingly, you can have the night of your dreams, even if you’re on a budget. 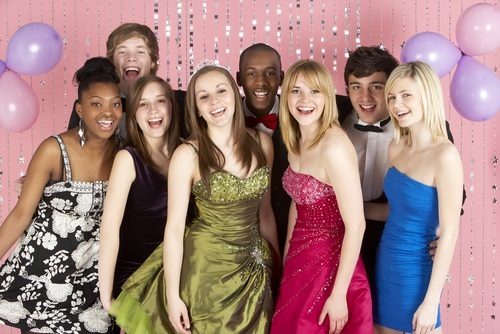 If your prom is a few months away, and you put away five dollars each week into your “prom fund,” you’ll have saved enough to cover the cost of your ticket, your limo rental, or your hair appointment. It might seem like a small savings, but think of it this way: you’ll hardly miss five dollars per week, and when the time rolls around, that’s one less thing you have to worry about. Remember — it adds up quickly! If you feel like you’ll be tempted to spend your savings, give it to your mom or a sibling to hold onto. Getting your hair and makeup done by a professional can end up costing you up to $150. Is it really worth it? You could pay a friend who’s in beauty school a few extra dollars to do it for you, or better yet, do it yourself! There are so many tutorials available on YouTube that teach you how to do even the most elegant hairstyles and makeup looks. You’ll feel proud of what you’ve done, and you’ll get to pocket what you would have spent on an expensive appointment. A lot of groups like to go out to dinner before or after the big dance, and that’s not something you want to miss out on. But, of course, that’s just one more expense on top of many others. Before you go out, check out Restaurant.com and Groupon to see if any nearby food joints are holding specials. You can often get a $100 gift card to a restaurant for up to 80% off, which you could then split amongst your group for huge savings. Don’t go anywhere without snagging a deal! Let’s be honest — whenever you get school photos, whether it’s for the yearbook or for prom, it’s pretty rare that you get a shot you’re happy with. If you make your own backdrop and hire a friend with a good camera — even if you pay them fifty bucks — you’ll get prom pics you’re happier with for a much lower price. You get the benefit of customizing your photos to look how you want them to look, without anyone telling you how to pose, and you won’t have to wait in that long, grueling line before the dance. If you’re taking a date, you’re pretty obligated to get him a boutonniere to match your corsage, but they’re surprisingly easy to make on your own. A florist might charge you $30 for one, but when you make it yourself, it’s much cheaper. All you have to do is find a flower in the color of your dress (or in a neutral color), a roll of silk or satin ribbon, and some fake leaves and baby’s breath which you can find at any craft store. Cut the stem, surround it with the fake greenery and baby’s breath, and tape it all together with green tape. Hide the tape by tying the ribbon around it — voila!